Remove Outlook Duplicates. Outlook duplicate remover add-in. Select comparison options to find, merge and remove Outlook duplicates automatically using 4Team Duplicate Killer. This powerful Outlook duplicate remover add-in will make your Microsoft Outlook work faster. Find, merge and remove Outlook duplicates automatically. Dealing with multiple duplicates in Microsoft Outlook can be very frustrating as duplicate items may cause your Outlook to perform slower. Duplicate Killer will save your valuable time removing all duplicates in just a few clicks, as well as Junk Contacts which contain too little useful information. Duplicate Killer is the latest duplicate removal add-in from 4Team Corporation that pays for itself instantly. This Outlook duplicate removal tool will help you to detect, merge and remove all duplicates. You can search for duplicates in all folders, including Microsoft Exchange and Public Folders or select a folder of your choice. Remove or merge duplicate e-mails, contacts, tasks, events, appointments, meetings and notes. Select comparison options to find, merge or remove Outlook duplicates automatically. Run Quick Wizard to delete identical items automatically or choose Advanced Wizard to select comparison properties manually. You can flag, back up and move duplicates to any folder or remove them permanently. Get rid of Outlook duplicate items to save your time and make your Microsoft Outlook perform faster. If you are looking for the fast and easy tool to remove Outlook duplicates from Microsoft Outlook folders in just one click, check out Outlook Duplicate Remover. No wizards to follow, no settings to adjust. Search for all types of duplicates. Search across multiple folders. Search for duplicates (identical items) in all Microsoft Outlook folders, including Microsoft Exchange and Public Folders or select a folder of your choice. Remove outlook duplicates from a selected folder or across multiple folders. Scan Inbox automatically. Automatic duplicates detection. Duplicate Killer will scan your Inbox for incoming mail duplicates and remove them automatically without prompting. Save your precious time and keep your Inbox duplicate free. Run Quick Wizard to delete identical items automatically or choose Advanced Wizard to select comparison options manually. Manage Outlook duplicates. Assign Outlook Categories. - Back up duplicates to "Deleted Items" folder. - Move duplicates to a folder of your choice. - Flag duplicates or assign a category. - Assign a category to a duplicate item. Outlook 2007, 2010 and 2013, 2016, 2019 categories are supported. Merge Outlook duplicates. Merge or Remove Outlook duplicate contacts. 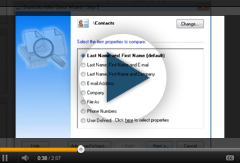 Remove or merge Outlook duplicate contacts and clean up your address book. Search for duplicates in distribution lists. 4Team Duplicate Killer employs a unique merging algorithm ensuring that no data will ever be lost. Merge Outlook Contacts and other duplicate items automatically or choose fields to compare and merge duplicate contacts, e-mails or tasks manually. Merge up to 5 selected items at a time. Due to unique merge algorithm, Duplicate Killer will intelligently merge all duplicate Calendar events and convert all 24-hour events into all-day events. Compare events by location, start time, subject, etc. to search for duplicate events manually. Search and delete contacts in Outlook which aren't useful. New! The 'Clean up Junk Contacts' wizard added in Duplicate Killer lets you search and remove Junk Contacts - the contacts in the address book that contain too little useful information, such as contacts with only one field filled in (phone, email, first name, etc.). You can choose to review the Junk Contacts found, update and save them or delete them. Identify and keep original items. Compare duplicate items and determine which one is original. An item is considered original in case if it contains data in more fields, it is the oldest or last modified, or it contains longer values. Select item properties to compare. Select all, default or custom item properties to compare. Compare items by size, subject, "from" and "to" fields, number of attachments, importance, "sent" and "received" time, etc. Save settings to a Profile. Save your Duplicate Killer settings to a Profile. Use profiles to search and manage duplicates in just one click. You can edit, Import and Export profiles or send them as an e-mail attachment. Saved profiles are available from the Duplicate Killer menu. Process all the saved search profiles in one click. View detailed search report prior to applying the selected actions. Finding and removing duplicates in Outlook manually may be time- consuming hard work indeed. With Duplicate Killer you don't have to look through hundreds of contacts or emails to remove duplicates manually. Duplicate Killer for Microsoft Outlook will save your valuable time removing all Outlook duplicates in just a few clicks, it pays for itself instantly. Unique duplicate detection algorithm. Back up duplicates. Duplicate Killer uses an advanced algorithm to find, merge or remove Outlook duplicates. This algorithm is unique and ensures that no data will ever be lost while removing duplicate items. Back up duplicates to the Deleted Items folder or delete them permanently. Compatible with Microsoft Exchange and all Microsoft Outlook versions. New! Compatible now with the latest Windows 10, Microsoft Outlook 2016 and Office 365. Also compatible with Microsoft Exchange Server. Manage duplicates in Microsoft Exchange and Public folders. Works on these Microsoft Outlook versions: 2019 (32 bit), 2016 (32 bit), 2013 (32 bit), 2010 (32 bit), 2007, 2003, 2002. ShareO for Microsoft Outlook Share Outlook Calendar, Contacts, Tasks and Email between users without a server. Scheduling. Sharing Free/Busy information.